more ways we can highlight and honor them. 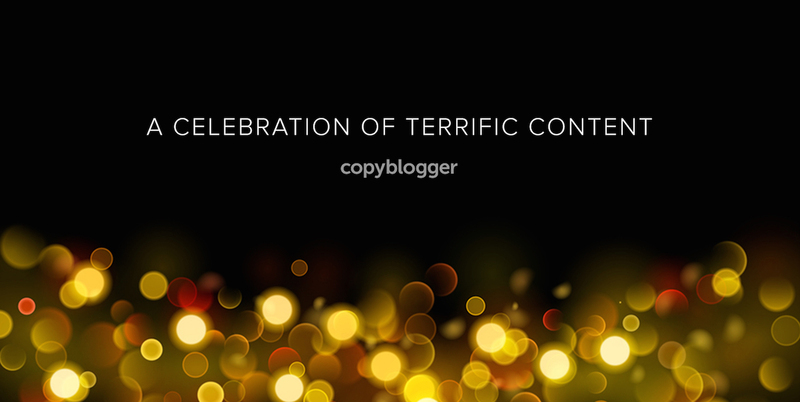 Earlier this month, Copyblogger held a contest for our community of Certified Content Marketers. It was a bit of a secret to the general audience, since it was only open to those selected folks. The contest was open to writers who hadn’t submitted their applications yet, as well as our currently Certified marketers. We got a nice pile of excellent submissions and managed (with difficulty) to whittle it down to five favorites. We looked for the same things we look for on Certification applications — first and foremost, a strong writing voice that’s informed by a strong grasp of content marketing strategy. We also went for posts and blogs that would be most valuable to Copyblogger readers — there were some very strong posts that missed out on this score. And we highlighted new writers that you haven’t seen on Copyblogger before — although we also have been delighted to feature content from writers in our Certified community like Alaura Weaver, Morgan Dix, and Beth Hayden. And if you’re looking for a solid content professional for your next project, check out our list of Certified content writers, marketers, and strategists. Every one of them has passed an extensive individual assessment (I handle many of them myself) of their writing and strategic skills. Jen has a very new blog that’s off to an amazing start. The site is called Jen Baxter Creative, and her winning blog post is called 3 Things You’ll Gain from Turning Client Questions into Shareable Content. We loved the way Jen’s crisp writing style worked with fantastic photography (that she shoots herself). Her posts are both meaty and inspiring. Jen has baked solid strategy into her site right from the beginning, with smart calls to action and a free downloadable worksheet on the winning post. We can’t wait to see what you do with the site in 2019, Jen! Karen publishes Stories Taste Good, a blog that helps food-and-beverage companies use story-based marketing. Karen’s winning post is called How to find your best marketing stories — and never run out of ideas! We loved the variety of story ideas she was able to tease out of a single (albeit interesting) vegetable. And the post did a great job of showing Karen’s potential clients how she would be able to help them craft fascinating content. Cindy publishes her blog at CindyDashnaw.com, and her winning entry was called 4 Steps to Great Nonprofit Storytelling. The post was useful and well-written, with detailed advice that her chosen audience can put to use right away. To benefit even more from her blog, we suggest Cindy use some well-chosen calls to action that would make it easy for clients to take the next steps to work with her. There truly were so many strong posts submitted to the contest, and we couldn’t resist adding two more as honorable mentions. Cheryl blogs at Cheryl Tan Media. She’s one of our Certified writers, with a background in television news. Cheryl’s site offers a wealth of great advice for working with the media as well as getting started with multimedia content, particularly video. Cheryl’s post is called The Ultimate DIY Guide to Getting Great Press It’s the first of a three-part series that’s all about how to craft and pitch the kind of story that journalists are hungry to share. Joe writes the Working with Joe blog, which highlights content and funding strategies for nonprofits and “Tech-for-Good” companies. Joe’s post submission is called What Sir Arthur Conan Doyle Can Teach Us about Building a Tech-for-Good Product. He hooks the reader with his lively writing style and strong topic. Joe also makes good use of calls to action to deepen the conversation with his selected audience. We’re so grateful to everyone in the community who submitted an entry! You really made it tough for us to choose our top five picks. We look forward to connecting with many more of you in our Copyblogger education community next year! It is so great to see sites like yours give back to the community and in doing so inspire others. Interesting also how so many of them turned to address fears and hesitations when it gets to marketing; there is definitely something there. And Jen Baxter has an amazing way of bringing across important issues in a simple way. But overall, all the winners have a very inspiring and thought evoking way of writing. Congratulations to the winners! Amazing how even your feedback becomes a source of education. I have learned things just from reading the comments. I look forward to 2019 and I am determined to get my blog working for me this year. Thanks for the inspiration. Thanks, Darren! Go get it! This is my first visit to Copyblogger, and I will of course be signing up to keep up to date. Fabulous content and style of delivery, something I can only aspire to be like for the future. All the very best for the coming New Year!